Melly Kay, BlytheLife.com, and Blythe! In my post below, I mentioned getting into the world of Blythe dolls. Well, over a year later I am still just as obsessed with these strange, amazing girls as I was at the beginning! BlytheLife.com is a fantastic blog, dedicated to all things Blythe! You can find great tips for saving up for your Blythe, storing all their clothes, and my favorite part - the interviews! BlytheLife.com has wonderful interviews with customizers, dolly clothing makers, etc. The latest interview is with Melly Kay! MK transforms Blythe girls into amazing, creative, and colorful individuals! She is an incredible artist, and people are falling head over heels for her work, myself included! So, head on over to BlytheLive.com, check out the wonderful site, and find out about Melly Kay! You'll be amazed! I'm finally back on track with my creating and sewing, and it feels great! A funk took hold of me for a while, it's nice to be getting back into the swing of things. 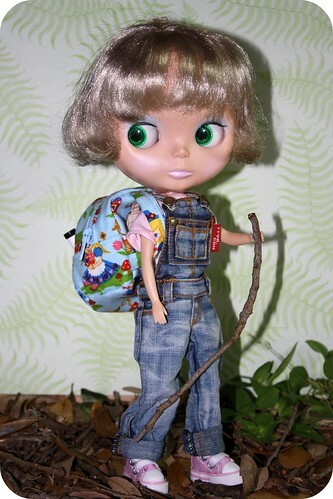 Back in September, I bought a Blythe doll for myself for my birthday. I had known of them for a couple of years, but never took the leap into getting one. Now I am obsessed! I'm doing a lot of sewing for the "girls". My latest creation is an adorable backpack. These dolls tend to acumulate lots of stuff, so I thought they needed a way to haul it around for themselves. That is my girl Clover, she is dreamy! I have 3 other girls - Monte, Fig, and Gertie. I also have 2 girls in pieces, one is getting a re-root of her hair. I'm sure I'll have more Blythe related goodies to show off here. I'm loving every minute of it! I've been having fun making hangtags for all my creations. I have glue all over my fingers, better watch out or I might stick to everything. It's time to get really busy making things. The craft show is only a little over two months away. I only have a few things made, why do I have to be such a procrastinator? From now until Oct. 1 I'm going to try and make at least two things a day. We'll see how that goes! I'm waiting on more fabric to come in the mail. My addiction to japanese imported fabrics is getting out of control! My sewing for the day was making zipper pouches. It's so much fun to use the new fabrics I picked up. The only bad part about the fabric is that it's so cute I want to buy more! Danger Will Robinson! I'm keeping the yellow one, there were a couple of mistakes I made on it. At least I stick to it and keep going. I think I'll head back to IKEA today and pick up another table. It's a pain having to move the sewing machine when I want to cut fabric or iron something. I want my sewing area to be as comfortable and practical as possible. A lot has been going on the last couple of months, and my sewing suffered because of it. We had family visit which was wonderful, then my father died, and my sewing machine crapped out on me. It's been a rough couple of months, but I'm finally feeling like sitting down and letting the creative juices flow. I splurged on a new sewing machine, a Husqvarna Viking Emerald 183. It sews through multiple layers of thick fabric like butter! 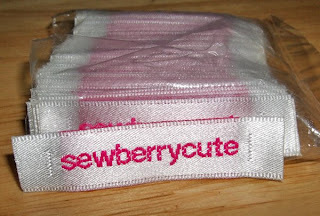 I also went a little fabric crazy, ordering about 20 yards of cute japanese imports from superbuzzy! Opening those boxes was breathtaking! My wonderful husband helped me pick out some stuff from IKEA to create a new sewing center. My old drafting table and chair had to go. Now I have a lovely space to sew my little fingers to the bone! I'll post some pictures later. Now it's time to get busy and have some fun! I'm feeling much better about everything, so that's the best time to jump back on the horse. I also have to give BIG thanks to Maree, from Work at Home Designs on Etsy, for designing my new logo! She did it in one day, it's everything I wanted and more! So if you need any graphic design work done, go see Maree! I can't say enough good things about her! My little acorns are on the front page of IndieSpotting, that made me a happy woman today. Pearl and I are taking it easy today, we're going to watch a movie while I work on my next project. We have to take it easy while we can, when her Dad comes home tonight it's out to power walk. My legs feel like jelly right now, I don't know how I'll make it. But I WILL! My woven sew-in labels came this morning! I must have looked like a crazy woman, running outside when I heard the doorbell. My hair was a mess of bedhead, and I could hardly function after having had a very hard time falling asleep. I was determined to catch that mailman before he left! The labels are great! I had them made by Lucky Label. They were fantastic in keeping me well informed of every step of my order. Plus you don't have to buy a huge amount of labels, you can get as little as 50 labels for a really great price. I can't wait to start my next project and get to use one. Can you tell I'm happy? Blogs of a Crafty Nature! Hi, I'm Kimberly! I love sewing and making creatures of all sorts. I'm Mommy to an adorable little girl, and Wife to an incredible man. My Facebook fan page! Fan me!